Hello everyone, this is the General Discussion thread for the next few weeks. 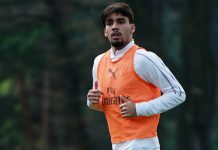 Paqueta to Piatek! I hope these two keep linking up like this. Donnarumma has been stellar this half. After a poor performance from the team. Good thing is magic from paqueta and piatek only needs half a chance to score. We need a much better second half let’s go!! 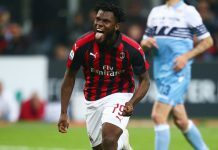 Kessie is gradually declining since the surge of Bakayoko. Gatusso should know better than me,but i think we should stop staying deep and start learning how to dominate too(just my opinion as a fan tho). Why r we turning against Suso? Only blind people can’t see the poor performances of Suso. If you’re not blind, take a fckng look again. Really getting fed up with this Suso guy and people who don’t see it!!! I’m so sorry about Suso. He doesn’t seem convincing anymore. Same about Hakan, they lack of spark. Once u have the ball, just shoot to Piatek. Poor game plan / coaching. Thanks so far to Piatek and Donnarumma. Refs are seriously against us. Poor game management by Gattuso. What can Cutrone and Laxalt do with 4mins of game to play? It would have made more sense to sub them in around the 70th or 75th min at least. Zapata has shown that he is more reliable than Mussachio this season. Poor position and poor touch to put Donnarumma in horrible position to save an own goal. Mussachio position is so poor on free kicks and corners which a strong suit for Zapata. I’ll take the draw since Inter lost to Genoa today. 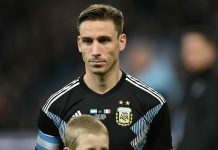 Laxalt for one could havce scored as i believe it was he WHO missed a howler in the last couple of minutes of the match. @Milanista121… what’s up bro. I responded to your comment twice and it didn’t post. I will see if does or not before I respond again. Denied of a penalty and a Roma red card for Pellegrini. This referee was a disgrace. AT least we are still at 4th. We need to bench Calhanoglu. Am getting pissed off with his style of play. He is a complete minus one in this team. He contributes absolutely nothing. Gattuso, why are u so glued with this Calhanoglu? 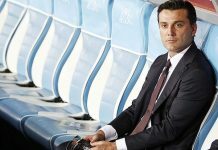 I like u and I like you as our coach but with this your choice of Calhanoglu every time, then my liking for you is fading. Pleaseeeee remove this calhanonsense and field better players. Totally agree. Absolutely disgusting gameplay by Milan. Amd here we go again with the Gattuso haters. What a buch of nitwits you are!!! Gattuso did everything right, but just fckng face it, it was Hakan and Suso who were so poor that they couldn’t put any pressure on the weak Roma defense. Name 1 fckng thing they did right today? 1!!!! I fckng dare ya!!! Next summer, sell Suso and Hakan and get 2 proper wingers or put Bonaventura on the left and get 1 right winger. Exactly my point. 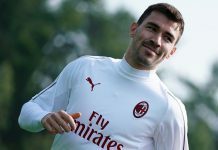 For the moment, if I was Gattuso, I would start Laxalt on the left and Castillejo on the right. Suso holds the ball for too long and just realized he is not so good with passes. Calhanoglu has been out of form. Donaruma has been God sent and Piatek seems to be God sent also. Rogmanoli did well today and why does Gatuso have to wait so long to make changes? 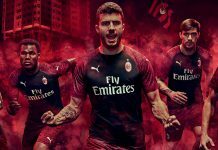 this is the excact same milan under gattuso. we will have 1-2 good games and then people will forget that we have other bad games. 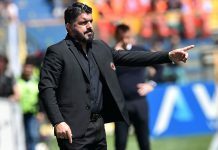 gattuso will be on the verge of being fired, then milan will win 1-2 games, and the talks just evaporate. and tbh, most of milan wins come from individual skills or efforts. nothing come from the game plan. 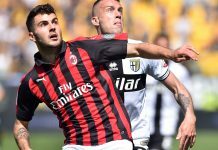 for a couple weeks milan will have suso carrying the team, the next weeks it will be cutrone, now it will be piatek. When you play 433 with both of your wingers out of form, this is tje outcome. Hakan is so painful to watch on that wing, he’s been poor since the start of this season. Rino is giving him all the playing time in hope he will regain his confidence… It’s been more than half a season! Bench him! When you go into such match where your opponent had lost shamefully on a high margin, you have to rush them aggressively cos they have lost their confidence. The whistles from their own fans is a big advantage for us,but Gatusso chose to play defensive. Paquetta is gradually becoming a defender and bet me that would affect his attacking instict. I love Gatusso but to be honest, we need a Gasperini. Enzo Millot might be a new name for Ac Milan Youth, currently plays for Monaco. 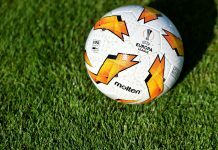 Ok guys, seriously – Çalhanoğlu needs to go! 1. 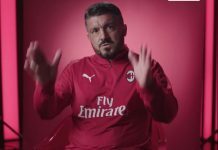 Gattuso reacts late with substitution. He is always afraid to take a decision as regards changing the game except when losing. 2. 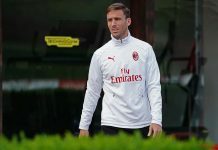 Suso and Pacqueta do not have strength for 90mins and were visibly tired 60 mins .Castiello and Borini should start some of the big matches. 3. 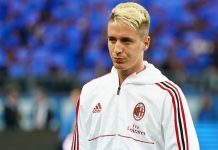 Conti should be ahead of Calabria. Pfffff…. How can people watch football when you don’t understand it?! Dude – when was the last time Çalhanoğlu had an “up” as you call it? He is not Milan material. I could kiss you Sakiru. Thank you for this post:) You forgot the red card Roma should’ve gotten as well. @nick, when things didn’t go our way he changed to a 4 4 2. After poor defensive displays and injuries he was right to go back to a 4 3 3. Now our defence and our midfield has been tremendous. It’s not gattuso’s fault that both suso and calhanoglu have been under performing. If anything suso should be playing his best football in a 4 3 3. As for calhanoglu. He’s been poor no matter where we put him which I’m upset about. Nick, our beloved Milanellofm is right, actually spot on. Suso and Calhanoglu are just not good enough. It has nothing to do with the formation. 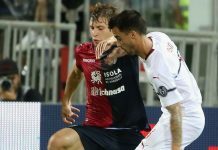 Suso is a winger, but too slow and mediocre in everything for Milan. Calhanoglu is not even a winger, but also not good enough for Milan. He was even very inconsistent at Leverkusen. 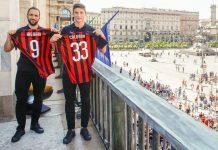 LeoDini should sell them along with Montolivo and Bertolacci. Then buy Chiesa and Bakayoko. 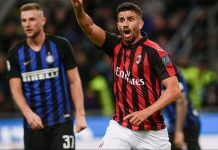 Guys, I know how bad 442 was for us, but I think Suso would do a lot better supporting Piatek wide on the right, I think sending him long passes suit him better, he is fast with a good first touch, he needs to be near the offside line. His passing and crossing is awful, and he always gets lots of pressure from 2 o 3 defenders. Too bad we can’t post GIFs where I now would post some person who is crying because of the low level of football knowledge he just read. If there’s anyone in Ireland, I see Eir Sports 2 are televising some Serie A fixtures again this week. I realise that obviously doesn’t suit non-subscribers. It doesn’t seem to be back on BT. Apparently it’s being televised by Premier Sports in the UK though..?